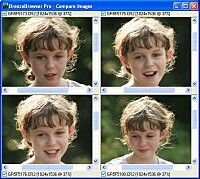 The powerful and versatile browser based tool for viewing and manipulating digital images. Do you need a fast and simple way to browse and select from your growing collection of digital photos or to create sophisticated web page image galleries without needing to learn HTML? Perhaps you need to rotate, crop and save your JPEG’s without any loss of quality or work with images in their RAW format. From batch processing to proof sheets, from posting to printing, from file format conversion to batch processing IPTC data or preserving EXIF information during JPEG or TIFF conversion... BreezeBrowser Pro has your solution. What Do I Need to Install BreezeBrowser Pro? An internet connection and Windows 10, Windows 8 or Windows 7 installed on your computer. In short..everyone! BreezeBrowser Pro is so easy to use yet contains all the features that working professionals have come to demand. You'll be up and running in minutes...no lengthy learning curve, no crowded and confusing interface and no need to get bogged down trying to master tricks that you may never use. On the other hand, BreezeBrowser Pro is a deep, full featured program that can take you as far as you want to go...smoothly, quickly and intuitively. Risk Free. Try before you buy. When you do decide to buy there is no need to download the software again - simply place your order and then enter your registration code to unlock the software.